Turkish desserts are a trademark of Turkey. Varieties are endless. When you find yourself either in a restaurant in Istanbul or you accidentally run into a sweets shop in the city of 7 hills, choosing a dessert to taste can be overwhelming. Make sure to try these three most tempting desserts. They are different than most desserts other cultures make. You know baklava. You know tahini helva. You certainly know Turkish delight usually served with Turkish coffee - called "lokum" by Turks. These you are very likely to try anyway. Consider the desserts listed below to enrich your sweet experience while in Istanbul. 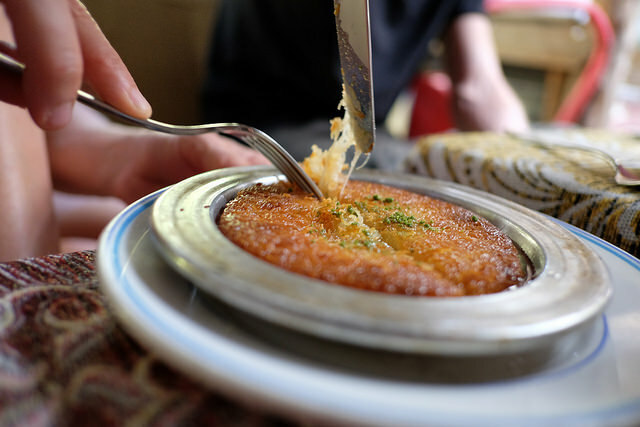 Kunefe is cheesy and rich Turkish dessert served warm, with pistachio dust on top. Fried thin noodle threads are soaked in sugar syrup. Unsalted soft cheese is used for filling. Noodles - cheese - noodles are layered and heated in the oven. Some chefs add butter, some vegetable oil to the dish. All Turkish pastry chefs sprinkle crushed pistachios on top of the kunefe. Yes, it is high in calorie. Ottoman Sultans treated themselves to it and offered the sweet to their guests. Burn your calories by walking to major tourist attractions in Istanbul or take a walking tour. Tavukgogsu ("breast of chicken" from Turkish) and Kazandibi ("bottom of a pan" from Turkish) are two separate desserts yet they are similar. Chicken is the key unusual ingredient here. Yes, chicken! And this is a sweet. 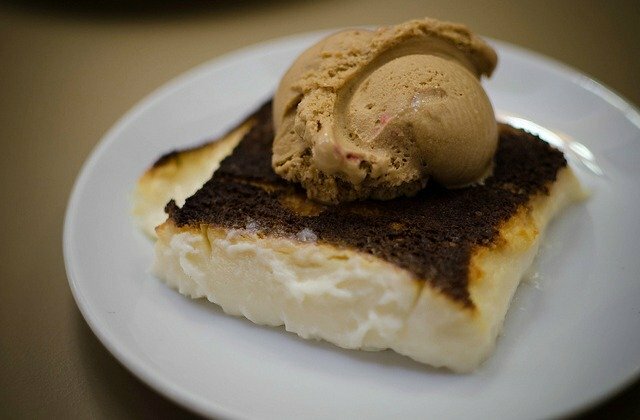 Milk pudding is the closest relative of these desserts. Fresh chicken breast is boiled until soft and shredded into fine tiny pieces. Milk, sugar and rice flower (or starch) are added. Your Turkish pudding - Tavukgogsu - is ready! Served cold with crushed hazelnuts, walnuts or cinnamon. Kazandibi is the Tavukgogsu with burnt sugar on top. A pan is sprinkled with sugar, the cooked Tavukgogusu is placed on top and after the sugar is burnt enough the dish is put up side down. 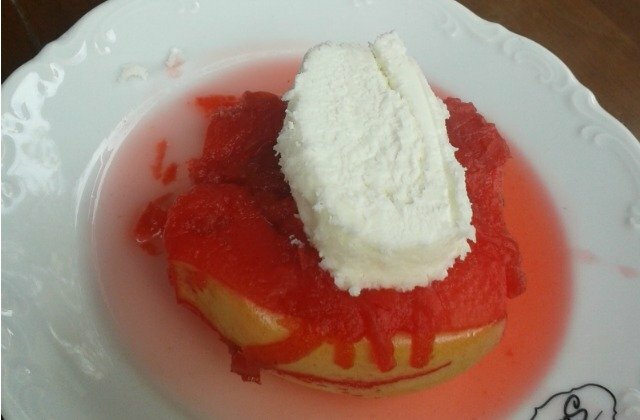 The name Kazandibi "bottom of a pan" comes from how the dessert is made. Chicken adds more to the texture than taste. See if you can find chicken threads in your plate! Cooks of the Ottoman Palace boasted this recipe to the world. Kesme dondurma stands for "ice cream that can be cut". This special kind of ice cream is made of goat milk and root of Orchis plant. 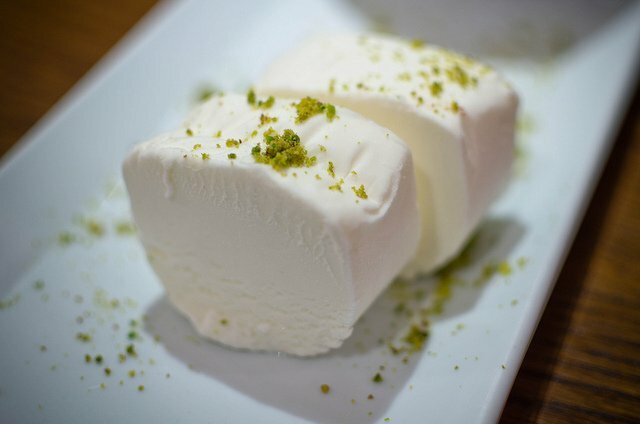 This Turkish dessert is also known as Marash ice cream after a city in southern Turkey Kahramanmarash where ice cream is believed to have originated. Kesme dondurma comes in different flavors - chocolate, pistachios, vanila. Usually served only to guests who don't mind sitting down. No kesme dondurma is served in cones or cups. Take your time, sit down and savor every bite of this Ottoman ice cream! Baklava. Gulluoglu and Kasibeyaz are your best baklava makers. Gulluoglu has a branch in Brooklyn, New York City. Various sweets. Koska is a brand that is known for various sweets including Turkish delight, helva and baklava. Koska has a branch in Cidde, Saudi Arabia. Ice cream. Several different brands claim to make the Kesme Dondurma. Mado is your best shot for getting true Marash ice cream. They have branches all over Istanbul and Turkey. Branches are also available in Australia, Azerbaijan, Northern Cyprus, Irak, Katar, Dubai, Russia, Bulgaria, Saudi Arabia. Kabak Tatlisi ("Pumpkin dessert" from Turkish) and Ayva Tatlisi ("Quince dessert" from Turkish) fall outside of the "three most tempting" rating because you can only get them during a certain time of the year. Pumpkin is boiled in sugar syrup and brought to caramelized texture. Served cold with cream and nuts on top (on request). Quince is also boiled in sugar and then baked with filling made of apples and cinnamon. Served cold with cream on top (on request). Pumpkin and quince are available in Istanbul starting from October-November. Restaurants and cafes start serving desserts made of them around those months. Recipes slightly vary from eatery to eatery. Great choice for seasonal fruit/vegetable lovers! Turkish desserts are rich in sweets made of fruit. Those are usually free of gluten and dairy. Make sure to ask for "no cream" ("kaymak istemiyorum" in Turkish) to stay out of dairy. Go for fig, plumb, peach, pumpkin or quince desserts. The fruit are usually soaked in sugar with spices and served with nuts. Bakeries in Istanbul make gluten free cookies. Ask for them and you'll be directed to the right shelf. Those cookies are not exactly Turkish desserts. You can still enjoy your time in Istanbul and follow your diet preferences. Have you discovered your own sweet treasure in Istanbul?